This VEGETATO (Woodland) Commando Kit includes the Shirt and Pants in Vegetato (Woodland Pattern). 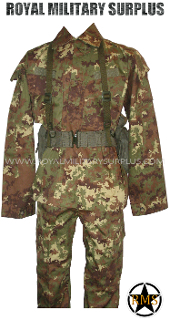 It also includes a SADF Pattern 70 Tactical Webbing. The Webbing is Original/Issue from the South Africa Army. Shirt & Pants are brand new and available in size S-M-L-XL-XXL. In use by Army, Military, Police and Special International Forces.